Kofta, believed to have originated from a Persian word “Kūfte” means “to beat” or “to grind” or meatball, is a surprisingly common dish in many countries, spanning from Greece, Middle Eastern Countries, to Indian and Pakistan. Not surprisingly though as these countries do share quite similar varieties of herbs and spices. Unlike the Italian meatballs, which are usually doused in general serving of tomato sauce, Kofta is usually served dry with dippings. Though in South Asian it’s often cooked in curry gravy too. There are of course regional variations; In Turkey for instance, it’s usually made with Lamb, Beef, Mutton or Chicken, while the Greeks would also use Veal or Pork. One thing in common though is the presence of spices like cumin, paprika and herbs like parsley, coriander and sometimes mint; Stuff that are always present in my pantry/fridge. I’ve chosen to stay closer to the Turkish version and made Lamb Kofta and pairing it with one of my favourite dips: Baba Ganoush. Partly because I think the name is quite endearing, but mainly because eggplant is my favourite thing to eat. Baba Ganoush is also quite easy to make, and the fun part is charring the skin over open flame. Minimal utensils needed for this recipe, which is a bonus. Put these 2 dishes together, you have a tasty yet nutritiously balanced meal. I shall also add that this is perfectly Paleo too. I found that the lamb version is tastier than beef (probably because of the fat content) and there is not much of a gamey taste from the lamb because of the lovely spices. So this is probably a good introduction to Lamb and Middle Eastern dishes if you don’t know where to start. As for the Baba Ganoush, it’s a must try if you love eggplants. Place mince, onion, garlic, mint, parsley, paprika, ginger, cumin, coriander seeds and egg in a bowl. Mix to combine. Shape 1/4 cup lamb mixture at a time into sixteen 8cm-long sausages with tapered ends. Thread 1 sausage onto each skewer. Place on a large baking tray or plate. Cover. Refrigerate for 20 minutes or until firm. Heat an large pan on high with some olive oil. Add koftas. Reduce heat to low. Cook, turning occasionally, for 10 minutes or until cooked through. Rest for 5 minutes before serving. Mmmmm! Love this stuff! I can have the whole plate to myself. Char the skin of the eggplant over the stove for 10 minutes (this imparts a lovely smoky taste), then cut the eggplant in half lengthways. Place on a baking tray, skin side up and bake in 180c oven for 30 minutes or until eggplant is completely tender. Cool the eggplant for about an hour, then remove the skin. Place the eggplant flesh, tahini, lemon juice, garlic, salt and pepper in a bowl and mash with a fork until smooth. It doesn’t have to be completely lump free, rustic is good. Taste to adjust seasoning. Garnish with a drizzle of olive oil, some paprika and parsley. 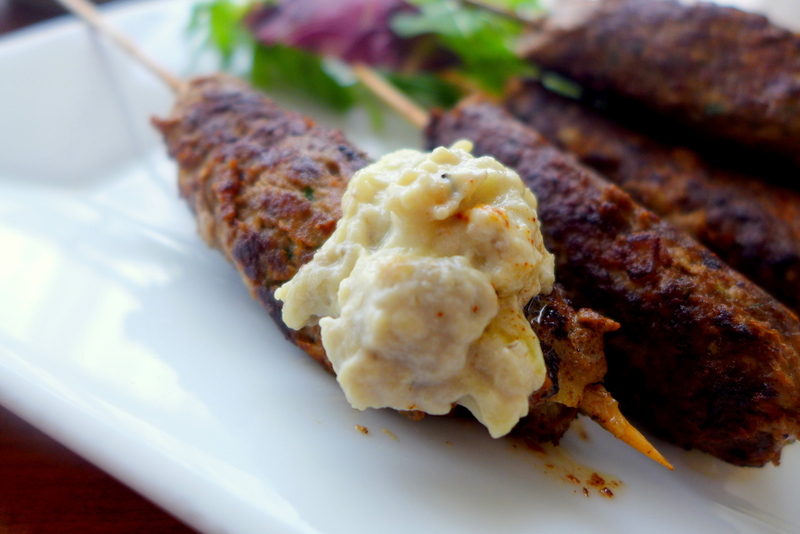 Thanks for the recipes Kelly, I love baba ganoush but always too lazy to make it…gona try the lamb kofta on the bbq. Thanks for sharing this. I am definitely trying out this lamb kofta!! You are welcome, hope you get to try it soon! Ahhh! Looking forward to your post! Lamb Kofta looks real enticing. Wonder what the ganoush tastes like, never tried both before. Sure would love to if I get the chance. 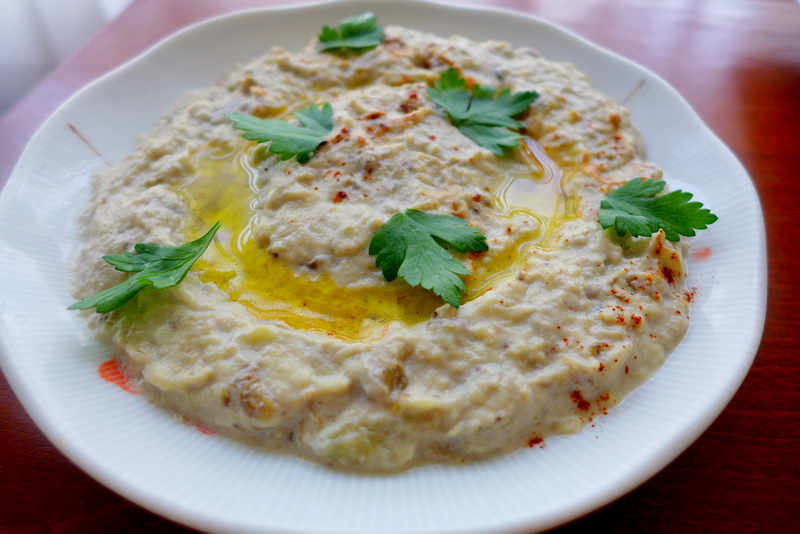 Hard to describe the taste of baba ganoush, it’s smoky, aromatic with the tahini and refreshing with the lemon too. oh looks so yummy! love baba ganoush and kofta too, but sometimes just too lazy to chargrill the eggplant. 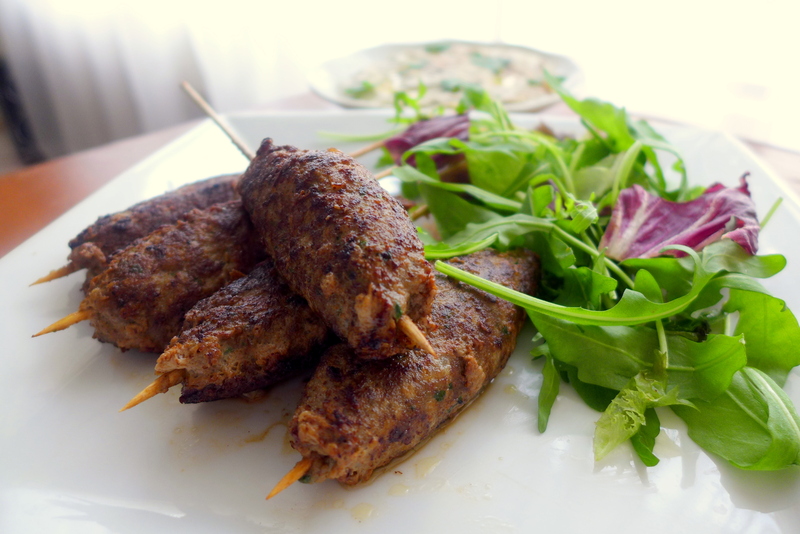 lamb + beef kofta are lovely too, the fattier lamb makes it lovely. I just leave the eggplant on the flame when prepping for other things. it’s quite a fun process! Yeah I would say lamb and beef version would work perfectly because it balances the fat a little la. Exotic stuff, Kelly! I am very interested to try it too! The ingredients are pretty easy to get, so hope you try it soon! I’m not too big fan of lamb but eating it this way is fine. Two great recipes here today. I can’t wait to give them both a try. This is a very fun make ahead meal for a gathering. Just grill upon your guests arrival. Wishing you a safe and happy holiday. Hope you get to try the recipes soon!